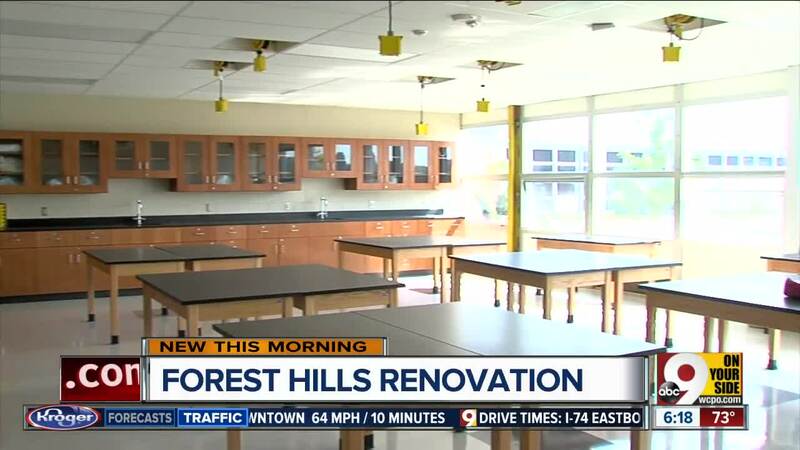 ANDERSON TOWNSHIP, Ohio -- While most districts in the tri-state have headed back to school, Forest Hills Schools are wrapping up a major construction project before kids enter the classrooms. Anderson High School has been going through a total renovation for more than a year. “A lot of the classrooms didn’t have flooring or ceilings so that we could get a head start as we’ve started this summer,” Forest Hills Assistant Superintendent Mike Broadwater said. Many of the classrooms are ready for students. New technology to the school includes wiring the rooms for presentations and and tablets, and air conditioning throughout the building. “We’ve got all new access points so that we’ve got a more robust system where we can put about 60 to 70 devices in one room,” Broadwater said. The renovations to Anderson High School also added a weight room for student athletes and others. Also in the Forest Hills district, Turpin High School saw some renovations which included increased security. “Every single school now has a security vestibule where we can lock down any intruder that may not be warranted to be in the building,” Broadwater said. Turpin also added more security cameras keeping an eye on the hallways, and security cards for staff entering the building. The school’s new gym is expected to be finished by October.